It’s interesting to chart the beginnings of a project that 30 years down the line is still resonating with you. 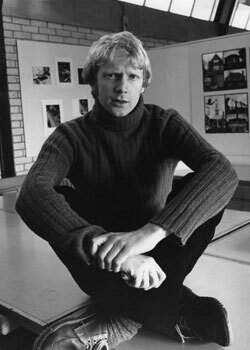 During years as an undergraduate student at West Surrey College of Art and Design (the portrait above was taken during this time by one of my lecturers, the famous Polish portrait photographer Jorge Lewinski), I wrote diary entries of my thoughts on all things photographic. As these diaries predate the ones I kept during the year I lived with the farming community in Bala, north Wales, it’s perhaps a good starting point to see what my initial thoughts were in relation to the project and then to react to these today. My first entry relating to the project was written on 10th February 1979 under a broader heading, ‘Reason for Photography’ This entry predates the beginning of the ‘Rhiwlas Project’ by 15 months but shows that I was clearly moving towards a classical approach to documentary photography. I was to photograph various subjects prior to starting the Rhiwlas project to gain the experience I felt I lacked at that time. It was important to critique my own work before embarking on such a major piece of work and my lecturers at the time were all more than willing to look at work I was carrying out along side my degree studies. A couple of points here – ‘…The next project I want to set myself…’ The work I was doing towards my final year was independent of assignment work in university. I always saw course assignments as informing my own work rather than defining it. Personal projects allowed me to develop in my own way, whilst taking from the course and my lecturers elements I felt relevant to how I was seeing photography. Photography was never something to be compartmentalised into a days university work. It was something I surrounded myself with all the time. It was something I loved then and still do now. This quote firmly establishes the way I believed good documentary work should be approached and nothing has changed my thoughts in the thirty years or so that have elapsed since I wrote those words. To ‘…get a feeling…’ and to ‘…understand…’ can only be achieved by spending time with those you are photographing, to establish relationships and to ‘merge’ into the background. The line that puzzles me is ‘The photographs will have to be planned’ What do I mean here? With the philosophy I was adopting and the photographers who I was inspired by, I can only believe I meant planned in the way you would not go into any situation without carefully thinking it through, planning it as it were. But planned here could imply a construction of the image in some way – a pre-planned shoot, where situations have been set up for the sole purpose of the photographer. This was something I never did but I did ‘plan’ certain shots. I remember clearly staking out certain locations and observing what was occurring and where best a photograph could be made. I was certainly planning a shot, but would never construct the situation in order to gain the image. 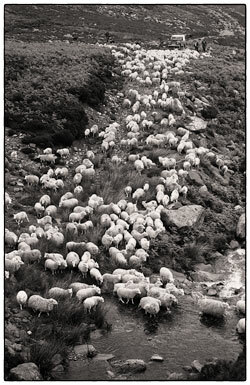 Knowing the best location to be in when the sheep were driven off the mountain was planning, asking the shepherd to drive them deliberately through a particular path that you know would create a fine image would be construction and this approach would fall out of the realm of true documentary practice for me.